Cyril is the only squirrel in Lake Park, and he’s very lonely. Until one day he meets Pat – Pat the big, grey . . . other squirrel. Cyril and Pat have lots of adventures and fun together and Cyril is so pleased he’s made a friend. 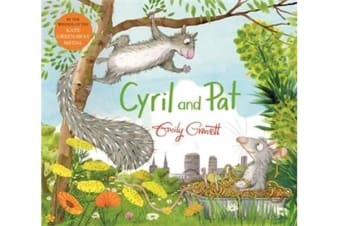 But everyone is adamant that Cyril and Pat simply cannot be friends, and they soon reveal why: Pat, as the reader has known all along, is actually a RAT! But Cyril’s life turns out to be a lot duller and quite a bit scarier without Pat by his side, and in the end the two friends learn that some things are more important than being the same, or listening to others. Cyril and Pat is a richly colourful, rhyming romp through the park from the CILIP Kate Greenaway Medal-winning Emily Gravett.